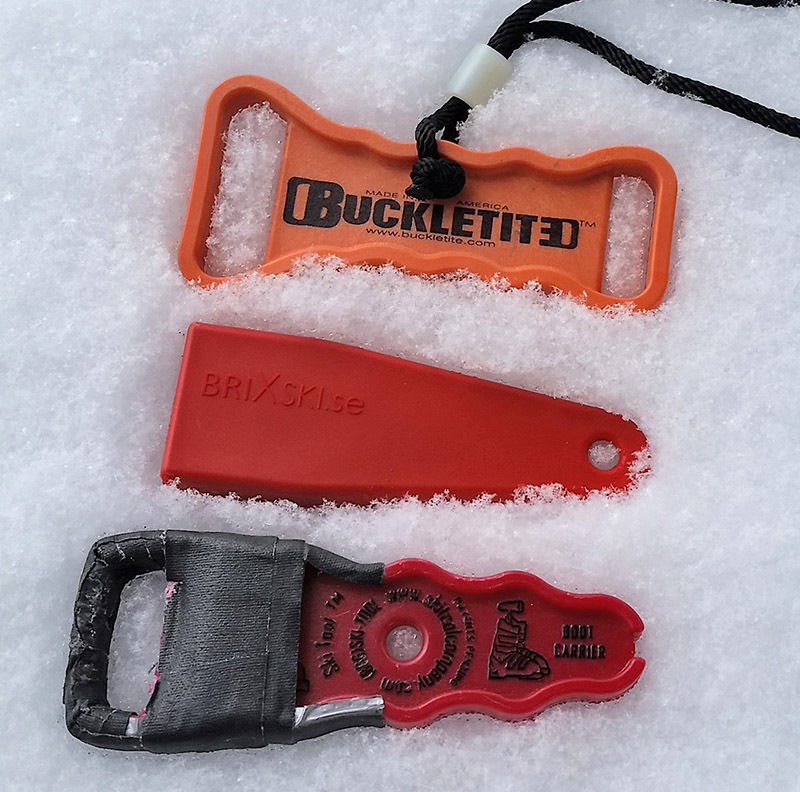 A previous post of mine titled, Seriously, I Need A Tool For Buckling My Ski Boots?, reviewed the SkiTool lever device that helps you buckle your ski boots. In short, the tool worked well for a little over a season or two, but then broke. I was able to repair it (with copious amounts of gaffers tape) to a point where I could use it again, but it has never quite been the same. Flash forward to several weeks ago, I was contacted by not one, but two other boot tool manufacturers and was offered a chance to review their devices. I also want to quickly address some issues that some have raised in the comments section of my previous article, questioning the very need for such a tool. Some have suggested to me that I must have the wrong size boots or that I’m over-tightening them if I have to use a tool to tighten them. First, I can assure you that I have the proper boot size (fitted by a professional). Second, I do not over-tighten by boots. I buckle my boots once, for the day, and then leave them buckled until I am done skiing. I do not have any problems with pain, circulation, etc. What I do have a problem with is getting by boots buckled up tight enough initially. The small buckles just don’t provide enough leverage to close on those last couple notches. Call me weak, or soft handed…fine, but I am confident that I have a good and proper boot fit. If anything, I find that many skiers (especially women) do not buckle their boots tight enough…which can make their skiing sloppy, less precise, and more dangerous. For me, a boot tool makes all the difference to easily get that perfect fit! 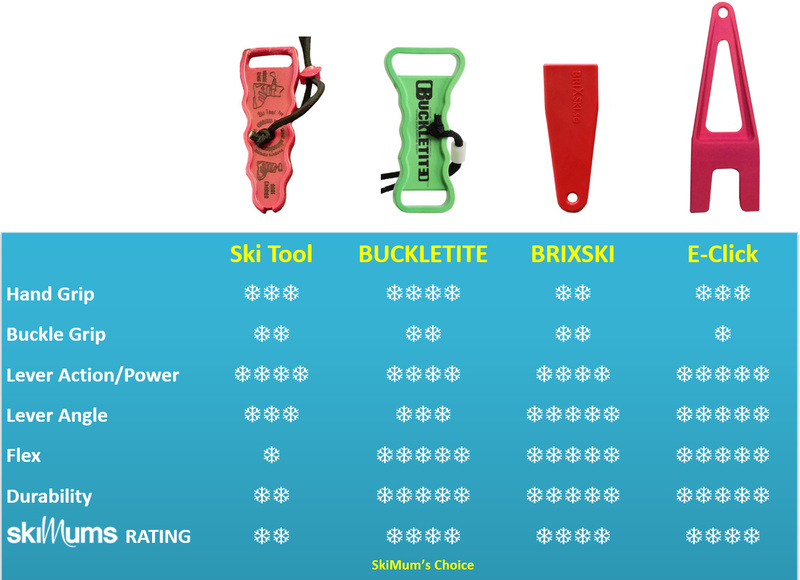 In this comparison I have reviewed the strengths and weaknesses of the three types of boot levers that I have used, namely, the SkiTool, the Buckletite and the BriXski. *: BriXski pricing is approximate and is based on current exchange rates – Swedish Krona to USD, and shipping from Sweden. How easy is the tool to hold? Does it slip in your hand? The best grip winner is the Buckletite tool. It fits in my hand well and doesn’t slide around. The SkiTool also feels pretty good in your hand and has little wavy sides for your fingers to wrap around. My least favorite grip of the three was the BriXski. It tapers down quickly and is very smooth. It’s not terrible, but my bare hand does tend to slip a bit when using it. How well does the tool hold on the boot buckle? To be honest, I did not think any of these tools held particularly well to my buckles. They all tended to slip around…or even slip off the buckle as I was applying pressure to them. The good news is that I have a simple fix for all of these – add a little fabric based tape (gaffers tape, duct tape, medical tape) to the surfaces or edges that come in contact with buckle. Very effective! No more slip! How well does the geometry of the tool work? How much strength and pressure is required by the user? All three tools actually do a good job here. After all, that is what they are designed to do. If I had to pick one, I’d say the Buckletite tool provided the best, most stable platform. The flair on both ends just gives your hands a little bit more control when applying pressure. Frankly, I never even thought about this until I started comparing these three tools side by side. 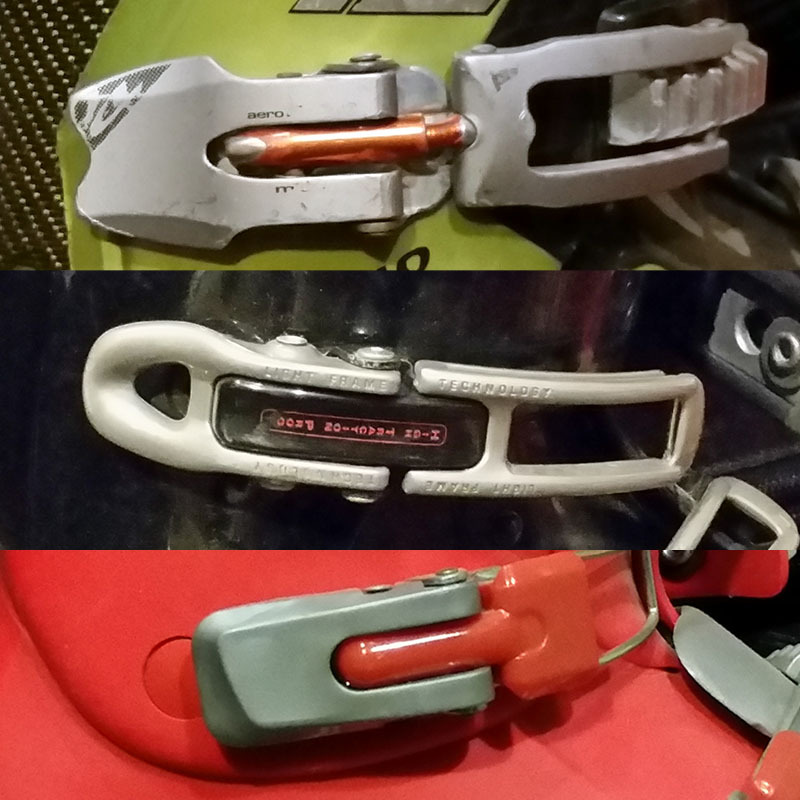 I quickly realized, however, that the angle at which you attach the tool to the buckle is much different with the BriXski tool compared to the other two. 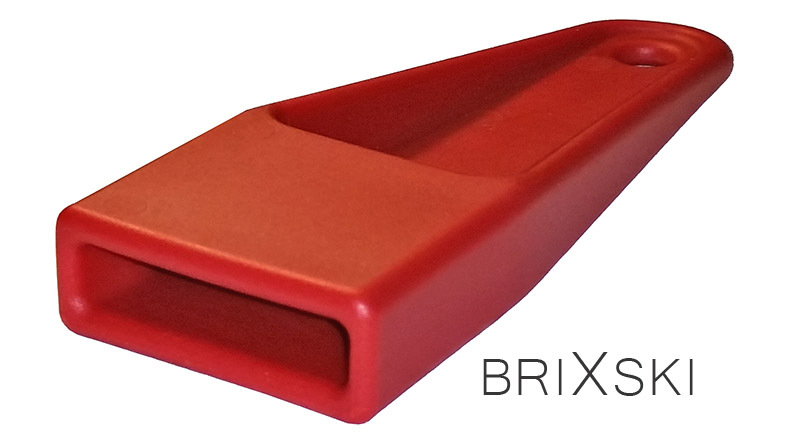 The BriXski tool’s unique design allows you to slip the buckle into the little opening of the tool. The result is a much easier “angle of attack” to grab the buckle. This description may not make much sense, so I have included a couple photos (below) to illustrate the difference. In the end, does it really matter? Maybe not, but I did find it easier and quicker to attach the BriXski tool without having to contort my arm. 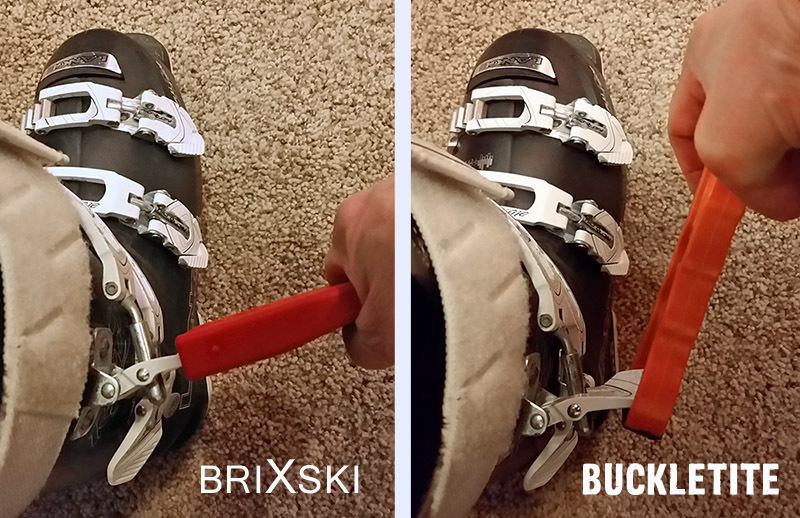 With all of that said, I did find a drawback to the BriXski tool, in that it does not work on all ski boots. While it seems to work on most of the new style buckles, it will not fit over some of the older style boot buckles. I found three different boots (in my attic) that the BriXski tool will not work with. The tool opening is just too small to accommodate the wider metal or fatter plastic buckles, including a pair of our kids boots. There should be little or no flex in the tool. From the first time I ever used the SkiTool it flexed just enough to make me nervous about it breaking (and ultimately it did). Both the Buckletite and the BriXski, however feel much different and much more solid. I have a hard time detecting any flex in these two at all. This increased rigidity helps efficiently transfer energy from your hand to the buckle, and gives you more confidence when applying significant torque. For me, the SkiTool fails the durability test. Its soft and flexible plastic just does not hold up over time. 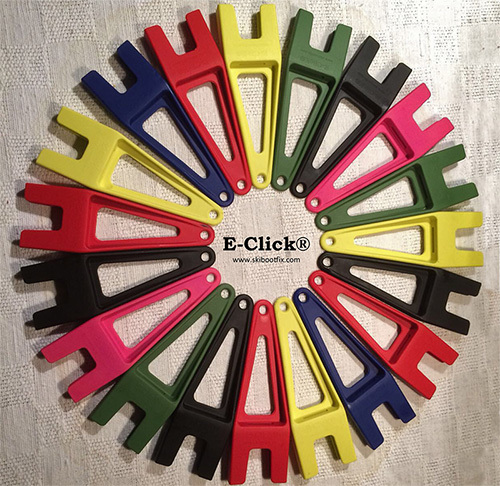 In contrast, Buckletite levers are made out of PROLON, a tough 33% fiberglass-impregnated nylon and they are guaranteed for life. The BriXski lever is made out of a material called PA6 45, which is a high quality plastic reinforced with 45% glass. It appears to be very tough and have almost a metal-like quality. Both Buckletite and BriXski also have great warranties on their products. If they break, send them back and they will send you a new one. To be fair, however, I have not used either the Buckletite or the BriXski tool for a comparable period of time as the SkiTool. Based on other factors, however, such as the flex and materials, I believe that both the Buckletite or the BriXski will hold up much better. Time will tell. I plan to check back with you from time to time and will definitely let you know if my actual experience differs from this initial assessment. SNOWBIRD, UT – Snowbird Ski and Summer Resort announced it will begin Aerial Tram operations on Friday, Nov. 20, during opening day of the 2015/16 ski season. It has been four years since the Snowbird Aerial Tram has operated on opening day. “We have had ideal early-season conditions with natural snowfall and cold temperatures for snowmaking, allowing us to open terrain from Hidden Peak all the way down through Gad Valley,” said Dave Fields, Snowbird Vice President of Resort Operations. Skiers and snowboarders can ride the Aerial Tram Friday, Nov. 20, to the start of Regulator, located at 11,000 feet. Skiing will be available via Regulator to Bassackwards, connecting to Big Emma. The combined territory of these runs totals more than 3,000 vertical feet and two and a half miles of skiable routes. All day tickets will be sold at a reduced price of $75. Snowbird chair passes will be valid on the Aerial Tram for a limited time. Snowbird’s shuttle will be running to transport guests to and from Gad Valley and Snowbird Center from 8 a.m. until 5 p.m. Creekside Lodge will be open from 8:30 a.m. until 4:30 p.m. The best lodging deals of the season are available to those who plan early. Early Bird Stay and Ski lodging and lift packages are currently available starting at $99/person (with lift tickets and free skiing for kids 12 years old and younger, double occupancy required) through much of December by calling (800) 453-3000 or visiting www.snowbird.com.